Published: Dec. 30, 2013 at 04:00 p.m. 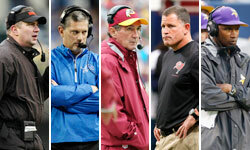 Updated: Dec. 30, 2013 at 05:08 p.m.
You can go ahead and take Jon Gruden out of the mix for any of the NFL head-coaching vacancies that have opened up in the last 24 hours. "I don't want to be considered for any of these jobs," Gruden said in a phone interview with the St. Paul Pioneer Press. "I don't want to be considered for anything. There are plenty of good candidates out there. I'm just sick for the guys who can no longer coach their teams. ... I'm hoping to do the best I can to hang on to my job." Gruden has worked as an analyst with ESPN since 2009. That followed a successful 11-year coaching run in the league, which included a Super Bowl win with the Tampa Bay Buccaneers in 2002. He's been out of the league since being fired by the Bucs following the 2008 season. Gruden's brother, Jay, is the offensive coordinator of the Cincinnati Bengals and has been speculated as another potential head-coaching option in 2014. Jon didn't want to make any predictions about where his brother might wind up. "He's happy to be at Cincinnati and excited to be in the playoffs," Gruden said. "I can't speak for him. ... I'm not going to. They're in the playoffs, and I'm obviously biased toward my brother." Gruden has carved out a nice niche for himself in television as Mike Tirico's partner on "Monday Night Football." Selfishly, we don't want him to ever leave the job. Who else will teach us the ways of "Spider two Y banana"?